Born in 1896 in Kheora, a small village in Bengal, now Bangladesh, Nirmala Sundari Devi was realized from birth. Though from outer appearances she had a normal childhood, even from this early age, she saw only with a divine vision. Her parents arranged a marriage for her in the traditional way, but her husband quickly recognized she was not an ordinary woman. Their marriage was never consummated and he later became her devotee. 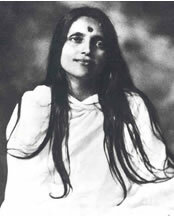 She was eventually named Anandamayi Ma, the bliss-bestowing mother. 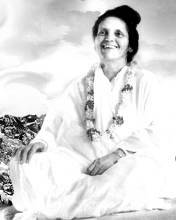 Though she never wrote or even gave spiritual discourses, she did answer questions and such talks were transcribed and compiled into several books. Her words have a loving, compelling, and very powerful quality about them.